← Tales from the Archive: I Love You, Èzili! M te rete nan dèyè simityè, nan Ri Flèry Batye. Ou konprann? M te rete nan mitan dèyè simityè a. M te rete nan mitan katye a.
I lived behind the cemetery, on Rue Fleury Bathier. You understand? I lived right in the middle of “behind the cemetery.” I lived in the heart of the community. 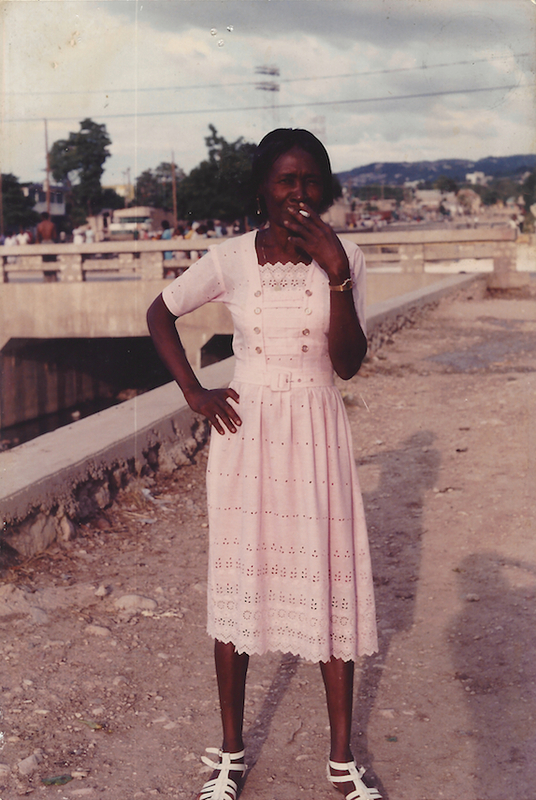 Rose Altine migrated to Port-au-Prince from Jacmel, circa 1910–1915. She settled dèyè simityè and had five children with Augustin Laguerre, one a girl they named Andrea. When Andrea grew up, she partnered with Julien Augustin and gave birth to Rose’s first grandchild, Frisner. See photos that I took dèyè simityè of Rose in 1982 (left) and Andrea in 1985 (right). Frisner nourished a deep and special love for both his grandmother and his mother. Rose covered for him when he sneaked out to Vodou dances, and he often told a story about her saving him from a zonbi—in the cemetery. He would sometimes catch his mother in the middle of the night, when she thought that he and his sister Marie Lourdes were asleep, praying before her ogatwa (prayer cabinet). He understood her struggle with poverty and took inspiration from it. Frisner’s spiritual roots lay with these women. When Rose passed away in April 1987, he acquired the family’s mausoleum in the Grand Cimitière. In October 1990 he buried Andrea in the same crypt. The photo above captured his intention to rest there, as he has since March 2012. 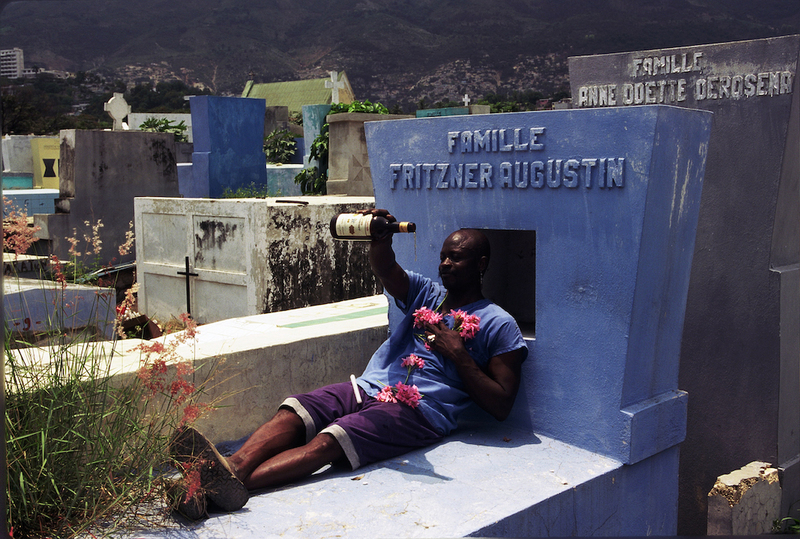 In many ways, the cemetery was an umbilical cord to the lwa for Frisner. Although his mèt tèt (principal spirit) was the warrior Ogou, Frisner nurtured a strong Gede, a spirit of the dead. Several places in the cemetery memorialize various members of the Gede nation, like the mural for Bawon and his wife Grann Brijit, which Frisner poses with in the photo to the right, or the large black cross for Bawon Samdi, seen in the video below. 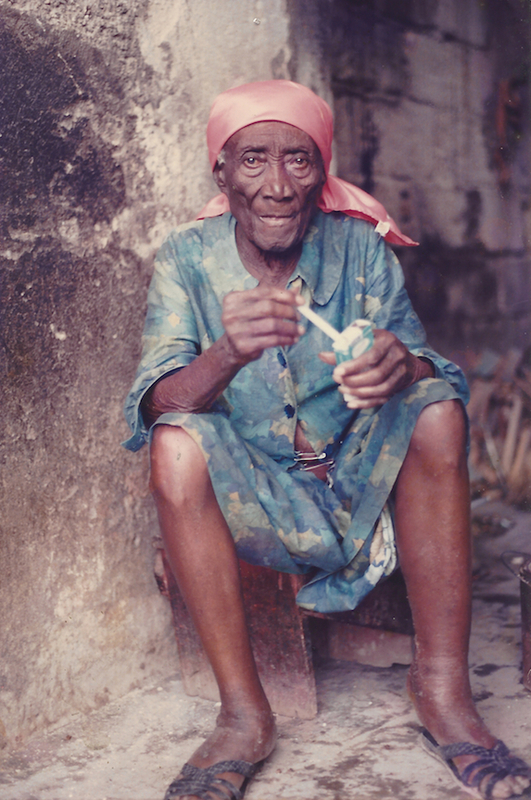 The video, edited with a Makandal track for Gede, features members of Frisner’s family and members of his cousin Mimose’s Vodou society. It includes prayers before the Bawon cross and a visit to the family mausoleum, where Frisner’s sister Marie Lourdes (purple blouse) pours libations. Note that we used a Makandal studio recording as the soundtrack for this week’s video. The video needs re-digitizing because of audio dropout problems. Makandal needs funds for this kind of work. We ask you to help us out by making a tax-deductible donation here. Meanwhile, we invite you to Makandal’s own 2015 Gede festivity. Information here. Many thanks for your support! 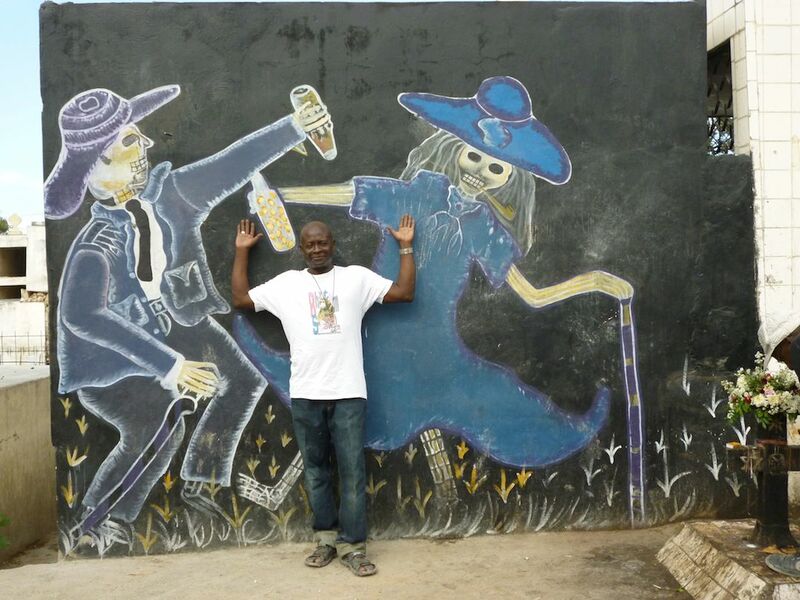 Photo by Lois Wilcken: Frisner Augustin poses before mural of Baron Samdi and Grann Brijit, Grand Cimitière, Port-au-Prince, January 10, 2012. This entry was posted in Tales from the Archive and tagged Archive, Drumming, Drums, Frisner Augustin, Haiti, Haitian, Haitian Music, Music, Vodou. Bookmark the permalink. I look forward to your narratives more and more. This was so interesting. The feedback means much. Mèsi anpil!